Today I shoot my first sporting event of 2018. After shooting 106 sporting events last year I have a lot to live up to this year. Last year I shot practices, regular season games, conference championships, NCAA Regional events, and NCAA Championships. It was an amazing year, and I don’t list those things off to brag. I list them off because a part of me still cannot believe that I am doing this for a living. This year I was paid to travel to nine states to make sports photos. Being paid to travel is cool, but when you are being paid to shoot a sporting event somewhere new it is even cooler. I love being on the road with the team. You get to know everyone much better, and you get to meet some great photographers along the way. Over the last two years I have met some great people who have helped me out a lot on these road trips. The is a hard list to put together. As I said before I shot 106 sporting events last year. Even making a top 106 would be tough as there would be multiple photos from one event that I would like. To boil that down to a top 17 is nearly impossible. I tried to go with the 17 moments or places that stuck out to me. I know that I am missing some for sure. The ISU track meet that they won after coach had just passed is one that seems like a glaring omission. 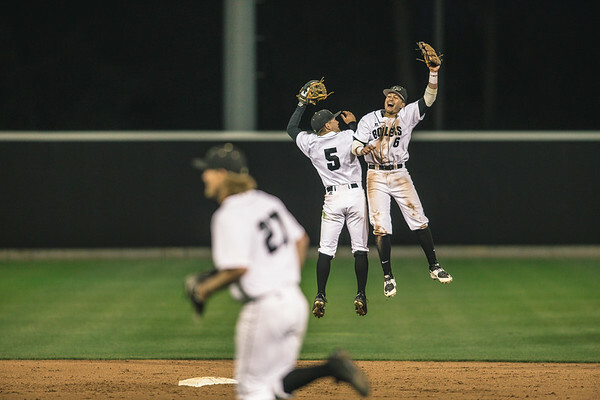 Covering the Purdue baseball team on their return to the Big Ten Tournament is another. It is just hard to whittle it all down to seventeen moments. Here is my attempt at my favorite seventeen photos from last season. 17. I can’t think of many ways that a National Anthem shot would make this countdown. I see so many of them in a year that they start to all blend together for me. 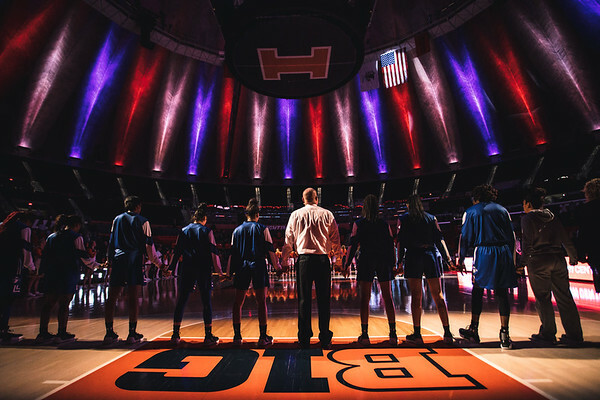 While photographing the Indiana State women’s basketball team at Illinois I noticed that the light was amazing. I went from the boring anthem shot that I had planned to this shot. It was not only an anthem shot that I liked, but it was one of my favorite sports shots of the year. This will be hard to top this year. I will scour every anthem during the year though to try and do just that. 16. I really did not cover much softball this season. During one game I knew that I was not shooting for anyone and the photos were just for me. It was then that I started playing around a little. I switched my camera to double exposure mode and started playing. Here I made the first exposure of the dark background and the Purdue P. I then would place a Boilermaker in the empty part of the frame. Maya Hughes seemed to know what I was doing and lean into the photo a bit for me here. 15. This year I covered two teams for Purdue that I had not since 2014. 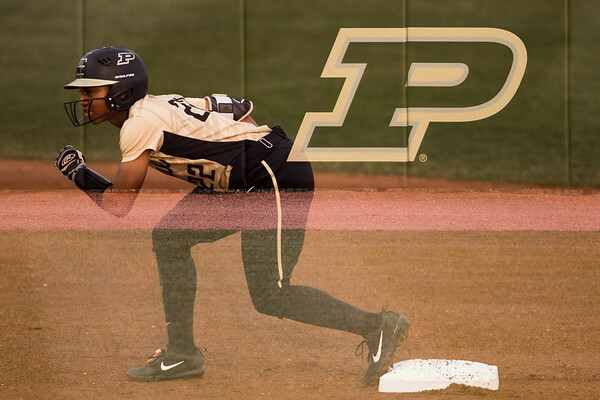 The first was Purdue baseball during a home game in April. I had not shot for the Boilers at home for a long time. 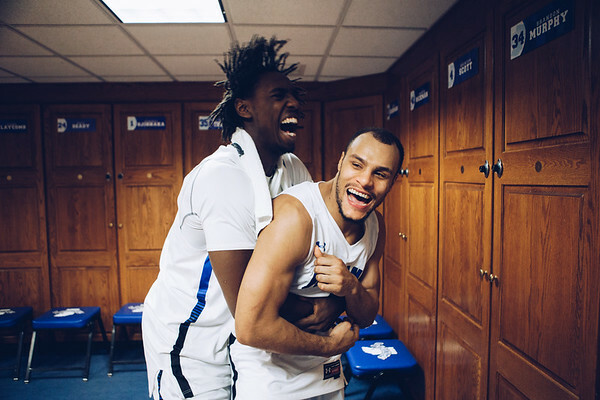 I was glad that they won that night, and my gallery could include this shot of two of the players celebrating. This was an amazing year for the team as they exceeded expectations and made it to the Big Ten Tournament. Luckily it was close in Bloomington although I would have driven much farther than that to cover it. On these dark, cold winter days you can’t help but wish for a warm night shooting baseball. This season cannot get here fast enough. 14. 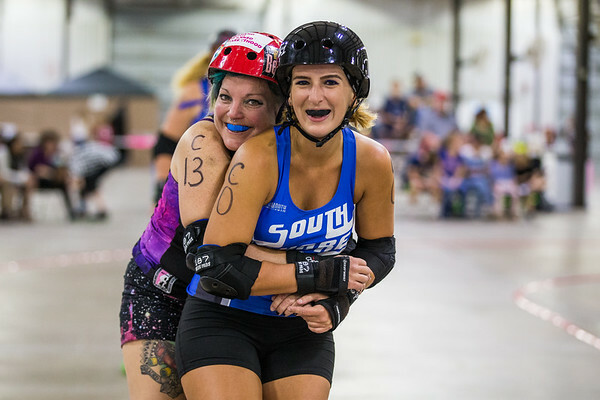 Another year has gone by as the photographer for the Lafayette Brawlin’ Dolls. This is truly the thing that is the most fun to photograph. I was only able to make three of their four games this year as I had other events get in the way. The players are great to me, and you can’t beat the photos. Here two former teammates hug during warmups while skating around the track. What other sport can you make this shot in? 13. 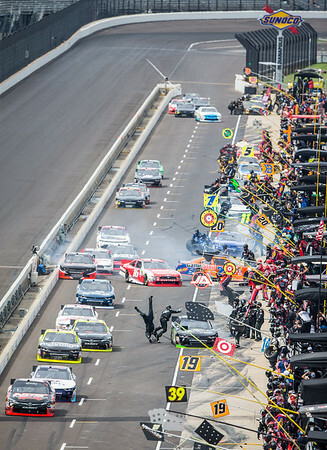 Knowing that the Brickyard 400 was moving to September made the event this year a must shoot for me. It will probably be the last one that I do as long as the event stays in September. Football season is a short season, and I want to photograph as much of it as I can. Here was one of my favorites from the weekend this year. I was on the roof of turn one shooting back into the action with a Canon 600mm lens that I was borrowing from CPS. I had the idea for this vertical shot of pit road as the cars came onto it. I had no idea that there would be carnage. Two separate incidents led to a fun photo for me. 12. 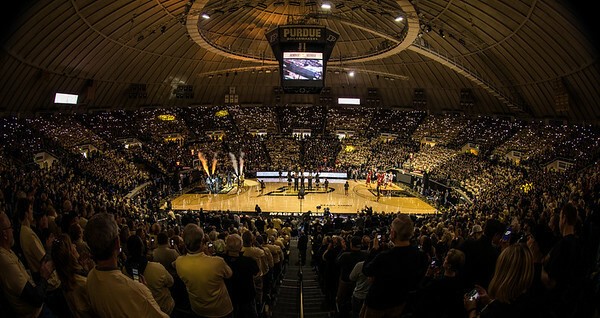 I love making wide angle pictures of Mackey Arena. My favorite game to do so is the annual t-shirt game. The patterns make for a nice background. Here I wanted to show off the arena and the new lights app that turns the crowd into part of the pre-game show. Looking at this photo it is amazing just how much the arena has changed in one year. I can’t wait to see what it looks like this year for the t-shirt game. 11. Late in the year I travelled up to Milwaukee to cover the Xavier men’s team open their Big East season against Marquette. Xavier had a chip on their shoulder after how the game went up there the year before. They came out firing, and I made this photo very early in the game. After making the bucket and getting fouled I was given a great moment. I don’t know if this makes it because it is so recent or if it is a good enough photo. We will see as time passes. 10. This was a photo that I really enjoyed making. You have Antoine Miles celebrating a big win over Indiana with the Hoosier players walking off the field with their heads down. This was a great season for Purdue. How is a 7-6 season a great season you ask? 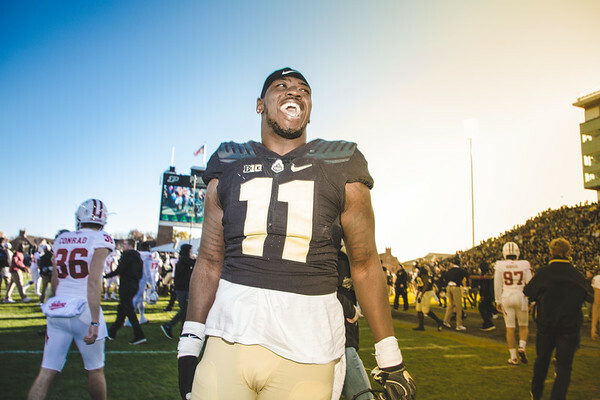 They made Purdue football exciting again. Next year Ross Ade Stadium should be packed to watch a team that is only going to get better. They used this win to vault into a bowl game that they won as well. 9. This photo was made during my first sporting event of the year. I think that I had the previous years best of post in mind when I made it. I was not shooting the game for anyone so I thought I would play around during the second half of the game. I wanted to try something because I could. I made this photo at 1/10th of a second to show a lot of the motion involved in basketball. 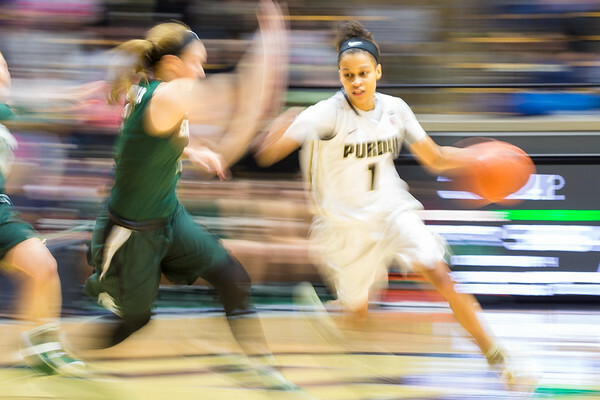 For a while I thought that I would photograph the Purdue women’s team first again this year, but it didn’t work out. They are fun to watch so I am sure that I will make a few more games this year. 8. 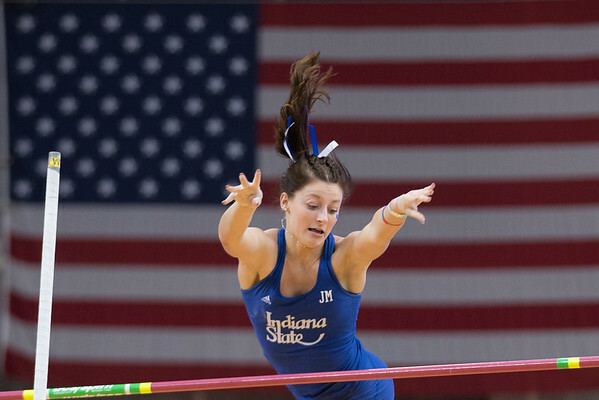 At the end of February I was covering Indiana State at the MVC Track and Field Championships at the UNIDome. The only event to start day one was the long jump for the two ISU decathletes. I made some pictures from ground level, and then moved up to make the photo above. 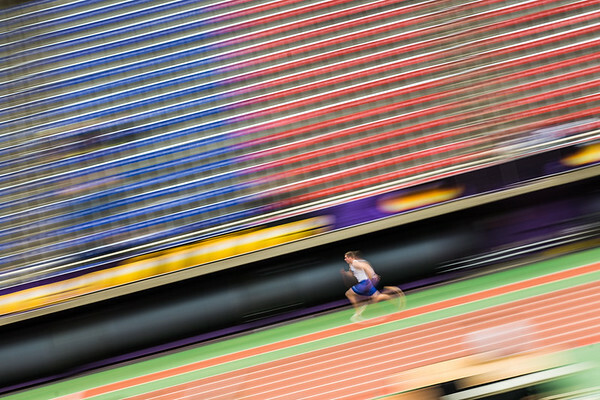 I made this shot at 1/6th of a second to really show the speed and blur the bleachers into a cool blur of colors. 7. 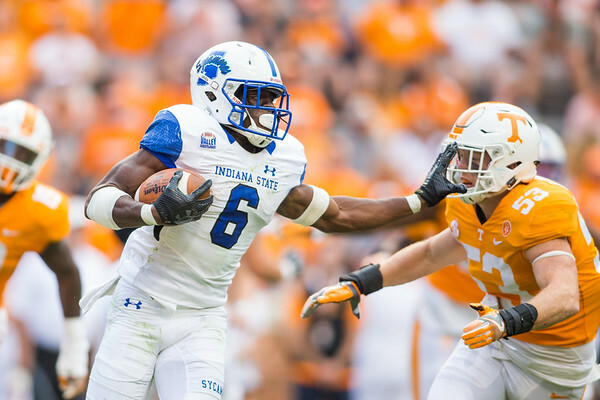 Indiana State had some big wins this year. None were bigger than the game at Indiana. After that game I was waiting for the emotional outburst that would be my photo for this countdown. The team acted like that win was no big deal. After a few bumps in the road they won their MVC opener against Valparaiso. I was treated to some of the emotion I thought that I was going to get in Bloomington. This is another recent photo that was fresh in my mind as I put this list together. 6. This was probably the best event that I covered last year. 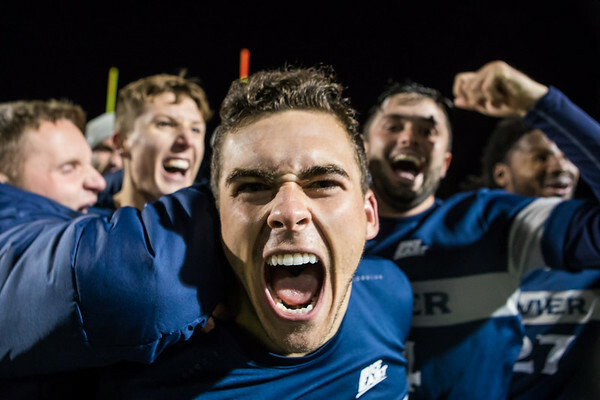 It was the Big East soccer semifinals between Xavier and Butler. The winner of the game would go to the Big East Championship game. Butler was the #1 seed and looking to pad their NCAA resume. Xavier seemed to be in control of the game before Butler scored twice to send the game to overtime. In both overtime periods both teams had great chances to walk away the winner. Neither team could so it went to penalty kicks. 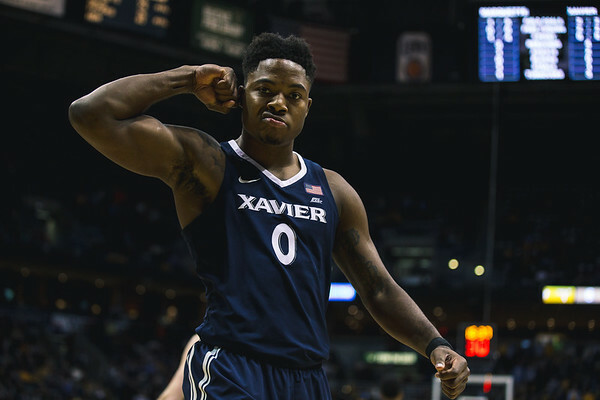 Xavier won and the celebration was on. This was a great game that had me on edge the entire time. 5. This year I was lucky enough to spend a fall weekend in Cincinnati covering a few sports for Xavier. The main reason to be there was to cover their version of Midnight Madness that they called Musketeer Madness. It was a great event where the teams were showcased to the fans for the first time that season. 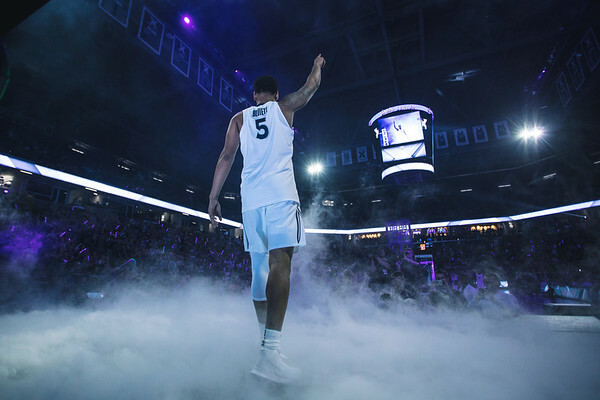 This was my favorite photo of the night as senior Trevon Bluiett was announced to the crowd. I knew what I wanted to do when he was announced so I moved to a position behind him a little early to figure out the shot. It would have been a good picture, but his one finger in the air made it a great one for me. 4. Speaking of fun moments this pile up after Purdue went up 6-0 to start the 2017 football season was a great moment. This was the first time that we had an idea that this team would be special. Purdue was big underdogs for the game, and could have walked away with the win. 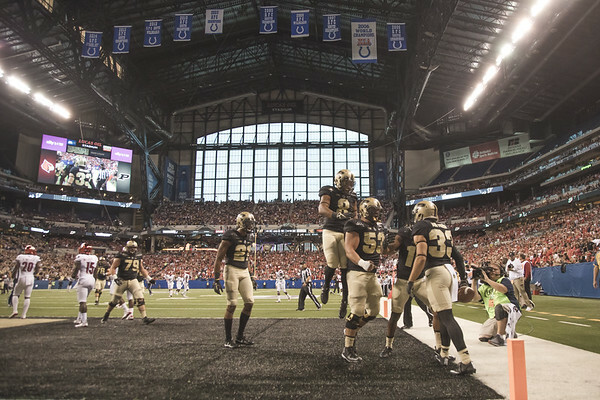 It was fun seeing the Boilers playing so well in Lucas Oil Stadium. I tried to go wide here to show off some of the big game atmosphere that they were playing in. 3. 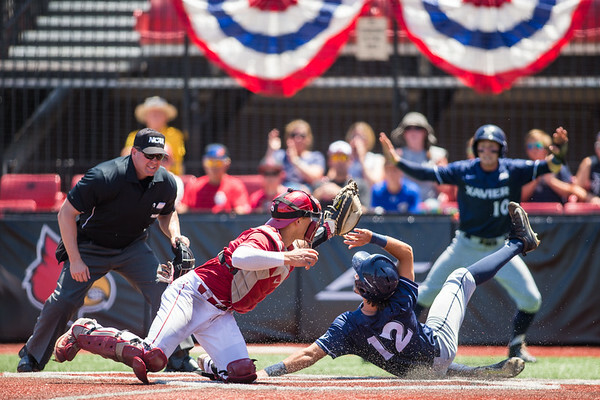 This was the second year in a row that I covered Xavier in the NCAA Baseball Tournament. The first year I shot for them in Nashville, and then last year it was a little closer in Louisville. That tournament was great fun to photograph with some great moments happening. I was able to see high MLB draft picks finish their college careers out. I loved this moment from the third base camera well as Xavier scored against Oklahoma. You get a sense of everything without the shot being too wide. I look forward to covering a few regular season games at Xavier for the Musketeers this year. 2. One of the highlights of the year for me was shooting at Neyland Stadium. Ever since my dad went there for business classes in the late 80’s I have followed the Vols from afar. I have always wanted to see a game in Neyland Stadium. To see my first one from the field was amazing. Here late in the game I stayed behind the Indiana State line hoping for a run my way. LeMonte Booker took the ball and ran right at me. The stiff arm on the Tennessee defender was just icing on the cake. It will be hard to top this football moment next year. It will be fun trying to though. 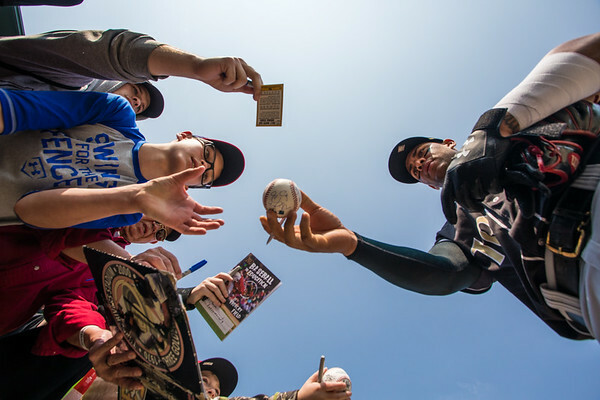 The top moment of the year was this shot of Yoan Moncada signing autographs for fans in Indianapolis. Moncada was at the time the top prospect in baseball, and he would finish the season with my White Sox. I went to the games to make pictures of him, but I had no idea that I would do this ahead of time. This photo was up for MiLB photo of the year which was a great honor. It lost to a much better photo which it should have, but it was an honor just to be involved in that process again. Next year I have a few items that I want to cross off of my bucket list in the summer. The White Sox farm system will help make that happen. This was a hard but fun list to put together. I really cannot believe the year that I had last year. At times I get down on myself because I feel like I am spinning my wheels a bit. When I look at what I have accomplished in such a short time I am really amazed. In 2013 it will mark the five year anniversary of the first time that I set foot on many college fields for the first time. The speed at which I was granted access was probably a detriment more than anything. I thought I was much better than I was at the time. The good news about sports photography though is that you are often brought back down to Earth. I just listed seventeen reasons above why I am very lucky. I always want to improve this list every year. Looking back at last year’s list here I think that I improved this from last year to this year. You can see that list here. The fun every year is trying to up the ante yet again. If I can post a better gallery next year then I will be in a good position. What a year filled with great moments! Today starts what I hope is a great 2018 in sports photography for me. If you have read all this way then you deserve more than just one more photo. I realized that I left this one out after I was done, and I thought that it just couldn’t be left out. I worked too hard to make this photo. During the MVC Championships at Northern Iowa I saw this flag positioned just behind the area where the pole vaulters were. I really didn’t see a way to make the picture until I realized that distance was my friend. I backed up a bit and used my long glass while laying across some pole bags to make this picture. I was in an uncomfortable position for too long of a time, but the result was worth it. I am writing this in 2018 so why not have 18 pictures to show? I can’t wait for 2025 as it will give me 25 pictures to post at the end of the year.